Like Sidney Crosby before him, 23-year-old Rick Nash became the latest player under 25 years of age to be named Captain of his team when the Blue Jackets awarded him the honor this week. Being the captain of an NHL team is a lot more than an honorary title and means a whole lot more than just being able to speak with the referees on the ice. If you need further proof, check out NHL.com's Impact! magazine, which goes in-depth on the subject. The subject certainly is germane in Columbus, where the Blue Jackets named All-Star forward Rick Nash team captain this week. He replaces defenseman Adam Foote, who was sent to Colorado at the trade deadline. The difference couldn't be starker. Foote is a defenseman with nearly 1,000 regular-season games. Nash is just 23 and has just over 350 games played. Is there a risk naming such a young player as captain? Perhaps, but the Pittsburgh Penguins saw no downside to naming Sidney Crosby captain at the start of the current season and he doesn't seem to have been compromised in any way, shape or form. 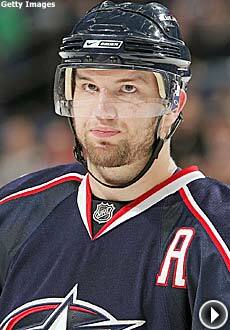 So the Blue Jackets have followed suit in naming their best player their leader, as well. Don't think it was a decision made lightly, since coach Ken Hitchcock never takes anything lightly. "He wasn't overwhelmed by the prospect of leading the team," Hitchcock told Tom Reed of The Columbus Dispatch. "He looked at it as a comfort thing. If he were captain, he wouldn't have to worry about speaking up or stepping on toes. He knew that would be part of the job." The two talked about it for quite some time last week and Hitchcock knew he was ready. Nash agreed. "I felt I was just at the right time to lead this team," Nash said. "I have been here long enough. It's a young franchise with a lot of young players (and) I think I can relate to a lot of them. I might be a lot more helpful than an older captain could be." At 23, Nash is the NHL's second-youngest captain, after the 20-year-old Crosby. For Nash, the decision marks another dramatic step in his evolution as an NHL star. At 6-foot-4 and 218 pounds, he already is a physical power, and anyone who has seen him play realizes there is a rare blend of gifts here, the ability to seamlessly mesh speed, size, strength and talent into one daunting package. He won't be alone by any stretch. Veterans Michael Peca, Freddie Modin, David Vyborny and Rusty Klesla are the team's alternate captains. "Him being the captain was the only choice to make," Peca told the Dispatch. "He's not too young. I was 23 when I became captain of the Sabres." "He is not only ready to accept this, he's ready to embrace it and be our leader for what we hope will be a long time coming," GM Scott Howson said. As for what kind of captain he intends to be, Nash pointed to Colorado's Joe Sakic and Calgary's Jarome Iginla as role models. "I'm not going to jump in and be some Mark Messier and start guaranteeing different things," Nash said. "We are in this for the long haul." Which is why the decision makes sense. Paragon of consistency -- Start a season with Marty Turco in goal and you can pencil him in for at least 30 wins. Oh heck, write it in ink! When Turco earned his 30th victory this season, it marked the fifth straight time the Dallas Stars goalie has won 30 or more games in a season. Guess who the only other active goalie to do so is? New Jersey's Martin Brodeur, so this is pretty select company. "Unbelievable consistency," Stars coach Dave Tippett told The Dallas Morning News. "The only other (active) guy to do it is Brodeur, and to get in the company with him, that's certainly a strong group to be in. "The consistency (Turco has) shown with our team, the ability to play a lot of games, to be able to win a lot of games, is something that has been a big part of our organization." No check? No Cup -- Vancouver Canucks assistant coach Rick Bowness has been around the game long enough to know what works, so on a team that has struggled to score goals this season, the importance of shutting down the opposition cannot be overstated. That's why the play of Ryan Kesler and Alex Burrows has been important for the Canucks. Not only have they chipped in offensively, but they also have done a good job shutting down the opposition. "Go back to what (Sami) Pahlsson's line did for the Anaheim Ducks last year," Bowness said of Pahlsson centering Rob Niedermayer and Travis Moen. "They don't win the Stanley Cup without that line. You absolutely have to have a line that can shut people down, is hard to play against and is chipping in goals. If you want to win the Stanley Cup, you absolutely have to have a line like this." Want to wear No. 91? -- Injuries to the defense has been a huge problem for the Buffalo Sabres recently, with Jaroslav Spacek and Dmitri Kalinin hurt in a game against the Rangers. What to do? Coach Lindy Ruff is turning to forward Jason Pominville in the event some other D-men go down. "I have no issue with him playing (against) rush opportunities," Ruff told reporters. "If need be, we'll throw him back there and he can be a little bit like (Sergei) Fedorov did in Detroit a few years ago, step back there and play some defense." Soldiering on -- One mistake is not going to scuttle a terrific rookie season for Washington's Nicklas Backstrom. Rewind to last Sunday, when Backstrom mistakenly shot the puck into his own net in an NHL on NBC game against the Penguins to give Pittsburgh the win. "I feel sorry for my teammates," Backstrom said this week. "I'm surprised by myself. I don't know how it could happen. (But) it happened. "I thought I was further in the corner and I was just trying to put it behind the net. It happened and I can't do anything about it now. I just have to go on and play the next game. … It's not the best situation when I did it, so it's hard. But you have to go on. I'm just 20 years old. I feel sorry for my team. That's all I can say." With the Capitals battling for a playoff berth, the gaffe indeed was costly, but the Caps have rallied around the kid, realizing one mistake does not a career make. "I'm sure he feels terrible, but the kid is going to win a hundred games for me in his career," owner Ted Leonsis said. 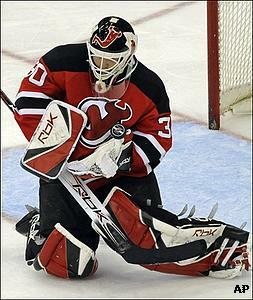 NHL head coaches agree that Devils' goaltender Martin Brodeur certainly lives up to the hype. Raves for Brodeur -- Jacques Lemaire and Guy Carbonneau enjoyed successful playing careers with the Montreal Canadiens, and while there, both men learned the value of goaltending. So it is interesting to hear the coaches of the Minnesota Wild and Canadiens talk about New Jersey Devils goaltender Martin Brodeur. "(Ken) Dryden, he was really good for a short time," Lemaire said. "And I know, at a time, he couldn't get ready to play and that's why he stopped. This guy (Brodeur), he's been doing it for a long time, and he'll do it until he's 40. "A lot of times there are a lot of things said that aren't really true," Lemaire continued. "Especially when you're talking about a good player. It is always overflowing of how great he is, how good he is, all this and all that. But with this guy, he's an exception. Everything they say about him is true." "He's probably the best goalie in the League right now," Carbonneau said. "He has been for years. He does what he has to do. You think his concentration may go down, but it doesn't." I meant what I said and I said what I meant -- Clearly, Paul Maurice has become one of Mats Sundin's biggest fans after getting the opportunity to coach him with the Maple Leafs. The coach also has learned to take Sundin at his word. "I think, of any player that I've ever heard quoted, Mats is the one guy where you can take exactly what he says, and that's exactly what he's thinking," Maurice told reporters when asked if Sundin might retire at season's end. "So if he told you at the start of the year he's taking it a year at a time, that he's going to assess it at the end of the year, that's exactly what it is." Dream comes true -- Andrew Murray was selected 242nd overall in the 2001 NHL Entry Draft by the Columbus Blue Jackets, played four seasons in college at Bemidji State and two more with the AHL's Syracuse Crunch. He has gotten to the NHL this season and Columbus coach Ken Hitchcock loves his desire and work ethic. "Playing in the National Hockey League is not going to go to his head," Hitchcock said. "He's one kid, I can tell you right now, who is going to appreciate every day at this level, because he's had to work for everything he's gotten." Reality check -- Drafted 13th overall in 1997, Dan Cleary played with Chicago, Edmonton and Phoenix before finally realizing his potential with the Red Wings, who signed him to a new contract this season. What made the difference for Cleary in Detroit? Attitude. "When I came to Detroit, I wanted to be a guy that the team could count on," Cleary said. "I just told myself, 'Work hard and your skill will come out. Show Ken Holland and Mike Babcock that you're a different person than I was when I was younger. Show them that I'm not that hotshot kid anymore.' "
Thanking the seventh man -- The Florida Panthers have reinserted themselves into the playoff race in the Eastern Conference. They headed into weekend action 6-2-2 in their last 10, tied with the Caps and five points behind Philadelphia for the last playoff spot. The fans have been coming out to see the Panthers, too, which hasn't been lost on the players. "The last couple games, even during the anthem, it's been awesome," center Stephen Weiss said. "There's been a ton of people there, and we need that extra push to help us out."